Clay County Sheriff Patrick Robinson is reporting that on April 14, 2019 at approximately 4:20 AM Clay County Sheriff Deputy Brandon Edwards arrested Lois Henson age 35 of Cemetary Road. The arrest occurred at Alvin's Gas Station when Deputy Edwards received a complaint of multiple subjects fighting at Alvin's. Upon arrival Deputy Edwards came in contact with the above mentioned subject who showed signs of being intoxicated. She was told she had to leave the property, when the subject unlawfully remained on the property Deputy Edwards went to place the subject under arrest. The subject resisted and pulled away from Deputy Edwards. Deputy Edwards placed the subject under arrest without further incident. 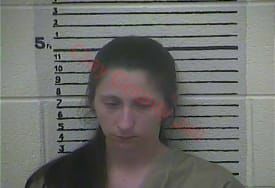 The photo attached is courtesy of the Clay County Detention Center.